Last week Susanah Terrell, the photography teacher from Georgiana Bruce Kirby Preparatory High School in Santa Cruz, brought her class down to visit Edward Weston's home and darkroom. All of the kids are learning black and white darkroom developing and printing. We met Susanah when she came down with the Society for Photographic Education for a Weston Scholarship Fundraiser last year. Susanah learned during her visit that she could bring her students down for a educational field trip. Kim gave a tour of the house and darkroom, brought them into our gallery and showed them Edward Weston photographs and his current work. 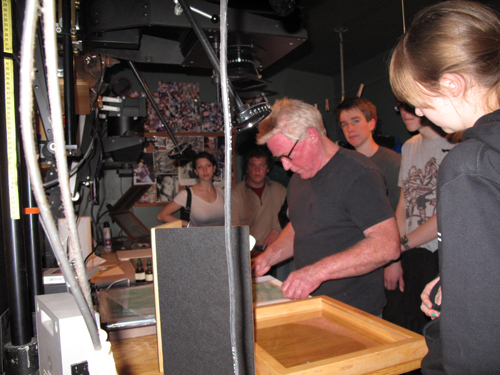 After the print showing, Kim gave them a platinum printing demonstration in his darkroom using a digital negative that he made on his computer. We had a really nice visit and were very excited to see all of the young photographers who were learning how to print in the darkroom with film!